Pleasant Grove Self Storage in Roseville, CA has both driveway-accessible and interior storage spaces, as well as temperature controlled storage in a variety of sizes to meet your needs. Drop by and acquaint yourself with our facility and staff. Once you’ve visited us, you will see why our customers like our central location and high quality storage facility. Our personal storage customers store everything from smaller personal possessions and household items to larger pieces such as furniture or major appliances. Our business storage customers store records, files, inventory items, pharmaceutical products, medical equipment, and so much more. At Pleasant Grove Self Storage, our goal is to make your storage experience as "pleasant" and convenient as possible. Our on-site management is available seven days a week to answer your questions and to facilitate storage space decisions. We offer a wide variety of storage sizes and options–some that are driveway accessible and others that are interior temperature controlled spaces–all at competitive prices. In our management office, we offer a large selection of moving supplies for all your packing needs at affordable prices. When renting a 10X9 size storage space, we also provide you with a free moving kit, containing boxes, packing supplies, tape, and more. Paying for your self storage services is easy. You may pay your rent monthly or take advantage of our long-term prepay special. We take all major credit cards and ACH debit. You can pay online here on our website or set up your account for automatic deduction. Call us at 916.772.1500 to learn about our competitive pricing. We offer a first-year price guarantee! We have the right size space to fit your needs. Choose from storage spaces as small as 5X5 and as large as 10X30. 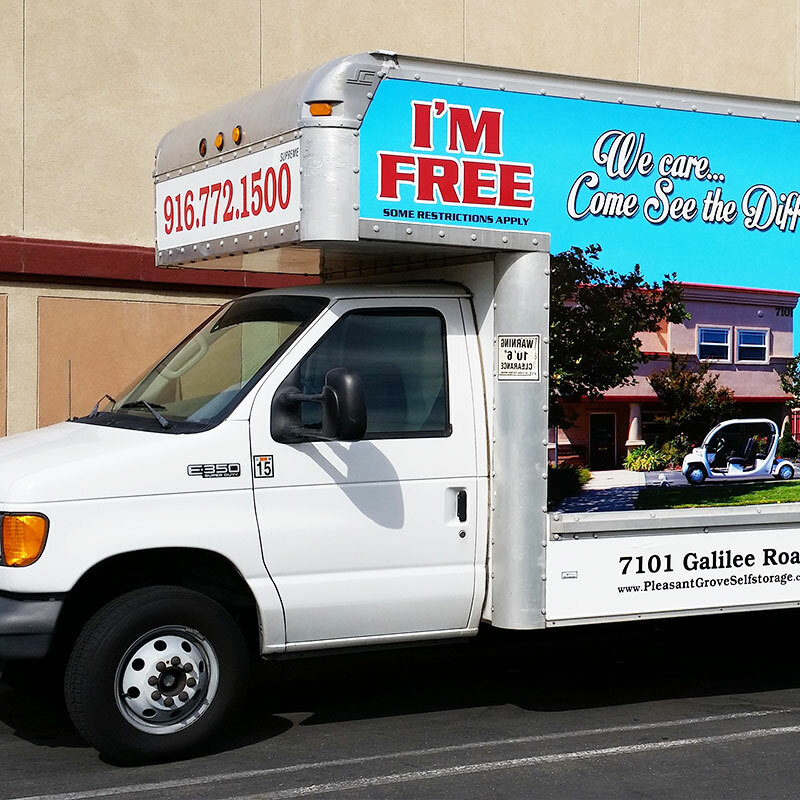 Use Our FREE Truck* To Move In! Let us help! If you’re moving locally, we will provide you with a FREE Moving Truck* to transport your belongings into your storage space at Pleasant Grove Self Storage. *Local moves only. Subject to availability. Some restrictions apply. We say, “Thank You,” to our armed forces by offering a 10% off of the monthly rental rate. We have the right size space to fit your needs. Choose from storage spaces as small as a 5’x 5’ and as large as 10’x 30’. Use our FREE Truck to Move in! Let us help! If you’re moving locally, we will provide you with a FREE Moving Truck to transport your belongings into your storage space at Pleasant Grove Self Storage. Our way of saying “Thank You” to our armed forces is by offering a 10% off monthly active military discount. As your business grows, are you finding less and less space to store important documents? Many small businesses are unable to keep up with the demands of managing business storage resources. At Pleasant Grove Self Storage we have many suitable and cost effective storage solutions. In addition to storage, we can facilitate the delivery and storage of important data and business merchandise. For your convenience, we allow delivery drivers access to your storage space at no additional charge. Just let us know in advance what you’re waiting for and have it shipped directly to Pleasant Grove Self Storage! Some restrictions apply to deliveries. Check with our office. Paying for your self storage is easy. You may pay your rent monthly or take advantage of our long-term prepay special. We take all major credit cards and ACH debit. You can pay online here on our website or set up your account for automatic deduction. You can pay your rent monthly or take advantage of our long-term prepay special. We will mail you a receipt directly for your accounting purposes. When you’re moving, the last thing you want to do is worry about renting a moving truck. Not only can it be time consuming and costly, but it can also be frustrating. We can help! If you’re moving locally, we will provide you with a FREE Moving Truck to move your belongings into your unit at Pleasant Grove Self Storage. Ask about using our moving truck when you visit our facility or during your consultation to learn more. When you’re moving, the last thing you have time to do is scrounge for boxes. And you don’t want to take your chances with used or old boxes when it comes to protecting your valuables. We have everything you need to safely pack and move your belongings – all at affordable prices. Current renters of Pleasant Grove Self Storage receive 20% OFF all packing and moving supplies. “After selling my Roseville home, I realized quickly that I had nowhere to go with my belongings! This is when my relationship began with Pleasant Grove Self Storage. I contracted to rent two of their “temperature controlled” storage units and had the pleasure of dealing with Sherri and Kenny, the Property Managers for this facility. They are very professional and have always offered a lending hand or an “ear” while planning my move out of state. I will not only be leaving behind a couple of empty storage units, but friends as well." Call us now to book the perfect storage solution for you or your business!